This Raspberry Chipotle BBQ Sauce is so delicious and versatile you’re going to want to grill with it every night! I broke this post up a bit and separated how to make the sauce and then how to use some of it on grilled pork tenderloin. 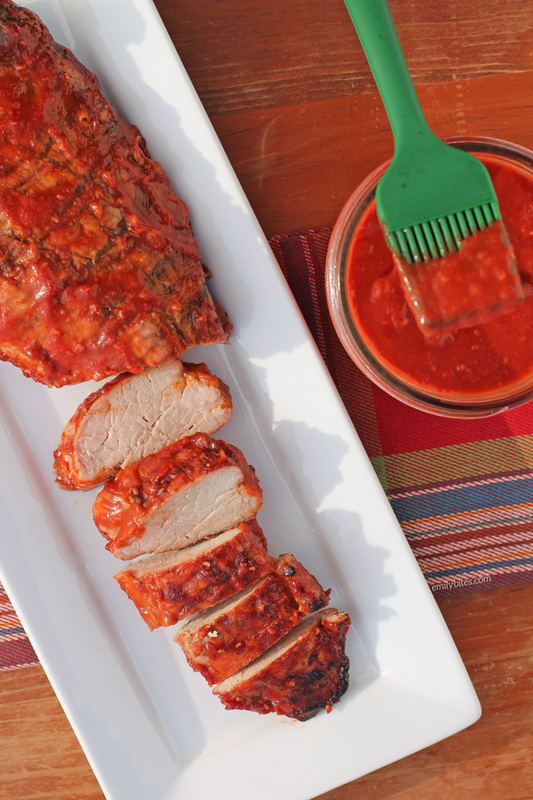 The sauce tastes incredible on pork; the tangy, spicy, fruity heat of the sauce just pairs with it perfectly. It would also be amazing on chicken breasts or thighs, ribs, chicken wings or probably anything else you want to put on the grill. Plus, it’s much lower in carbs than most store bought sauces, so you can slather it on without worry. 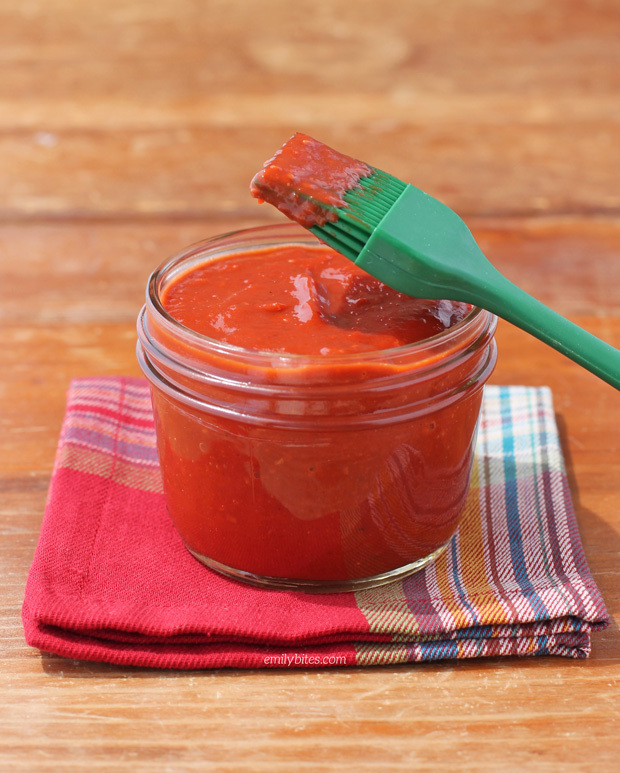 You might be surprised to find how easy it is to make your own barbecue sauce, it comes together simply and quickly on the stovetop! 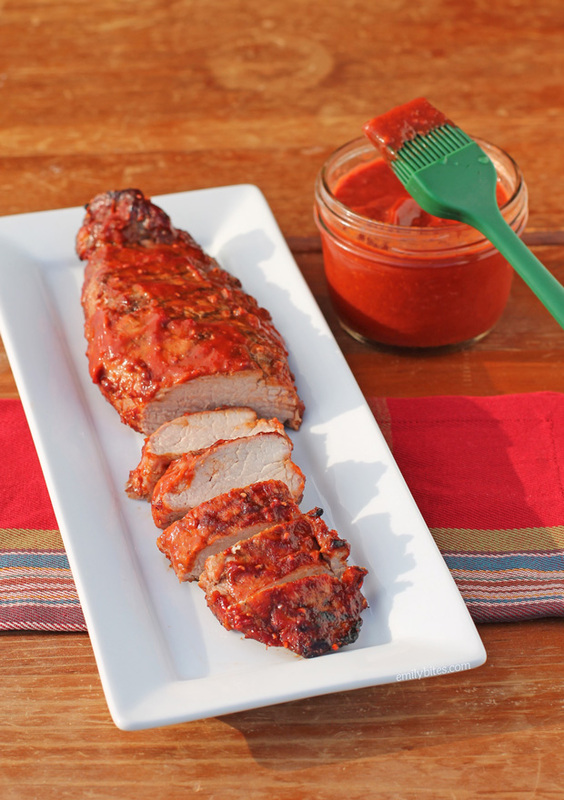 The best part about this Raspberry Chipotle BBQ Sauce is that it makes extra (enough to make this particular pork recipe three times! ), so you can refrigerate or freeze the rest and use it again. I separated the nutrition information below to show the amounts for the total BBQ sauce recipe alone (in case you use it for other things) and also for the pork with sauce used. I hope it’s not confusing! I changed it a bunch of times trying to make sure everything was worded clearly. Want more tasty recipes to make on the grill? Try my Black and Blue Burgers, Thai Chicken Skewers with Peanut Sauce, Lemon Pepper Iced Tea Chicken, Hawaiian Chicken Skewers, and Mexi-Burgers with Guacamole! *Sauce recipe makes 1 ½ cups, but we’re only using ½ cup for this recipe. Refrigerate or freeze the remaining sauce to use another time, or use more pork if you’re cooking for a big group! Bring the oil over medium heat in a medium sauce pan. Add the onions and cook for 3-5 minutes until translucent. Add the minced garlic and cook for an additional 30-60 seconds until garlic is fragrant. Add the chipotle peppers, tomato sauce, raspberries, brown sugar and cider vinegar and stir together. Bring to a boil and then reduce heat to simmer for about 15 minutes. Using an immersion blender (or a regular blender), blend the sauce until smooth. Refrigerate in an airtight container until ready to use. Set aside ½ cup of the Raspberry Chipotle BBQ sauce. Pre-heat the grill to medium temperature. Place the pork tenderloins on the grill and grill until almost fully done (cooking times will vary by grill, ours took about 15-20 minutes). When the tenderloins are almost cooked, move them to indirect heat (either the top “bun shelf” if your grill has one or a burner that’s turned off with the other burners on high). 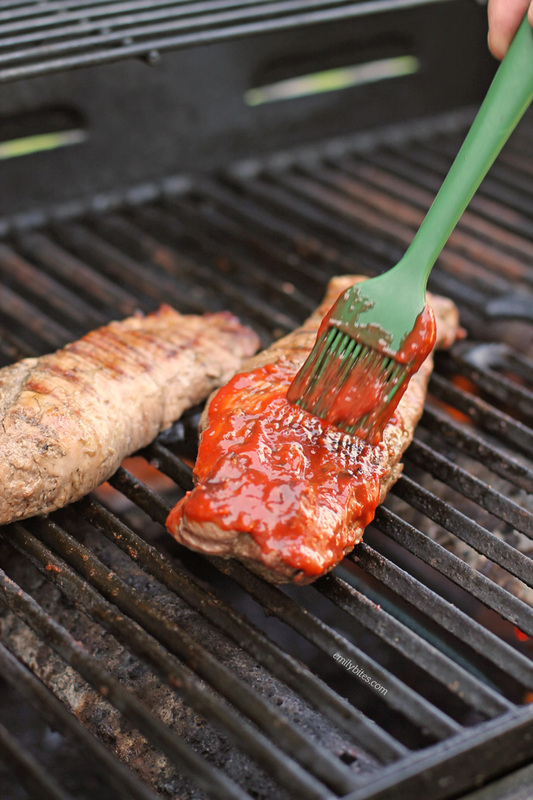 Use a pastry brush to brush the top and sides of the tenderloins with about half of the reserved BBQ sauce. Close the lid and let it cook a few minutes while the sauce cooks on a bit. Flip the tenderloins and use the remaining sauce to brush the other side. Close the lid and finish cooking until pork is cooked through and juices run clear. This sounds yummy! Do the raspberry leave seeds behind?